For years, families with loved ones buried at St. Johannes cemetery near Bensenville fought the city of Chicago’s repeated attempts to move the burial ground to make way for a new runway at O’Hare Airport. The case made its way all the way to the Illinois Supreme Court. Early last year, the court ruled against the families, clearing the way for the city to begin moving nearly 15,000 graves in the cemetery which saw its first burial in 1849. Now, that move is over. And while some are still bitter about the disinterment of their loved ones, others speak of overwhelming kindness on the city’s part. A decades-old fight over the expansion of O'Hare International Airport has come to an end. Clifford Sell is among those who feel steamrolled by a city determined to bulldoze his loved ones graves. "They should be there until the day of resurrection," he said. "There were over 14,000 graves there you know." Sell counted 20 to 30 relatives at St. Johannes, including his grandparents, Albert and Clara, who were buried there in the early 1940s. He laughed as he recalled how his grandfather boasted that his father voted for Abraham Lincoln, and he said that when the St. Johannes Church was moved in the late 50s to make way for construction of O’Hare Field, the city promised the cemetery would remain untouched. Sell’s family was the plaintiff in the suit against the city, a struggle which spanned years and finally met a dead end at the Illinois Supreme Court last January. City officials immediately made preparations for moving the 1494 graves. Archaeologists and a genealogical staff were hired. Many families were frustrated in their requests to observe the exhumations of their loved ones. Sell said he was forced to watch the removal of his grandparents, whose funerals he attended as a boy, from hundreds of yards away. Aviation commissioner Rosemarie Andolino insists she made the families’ needs her first priority. 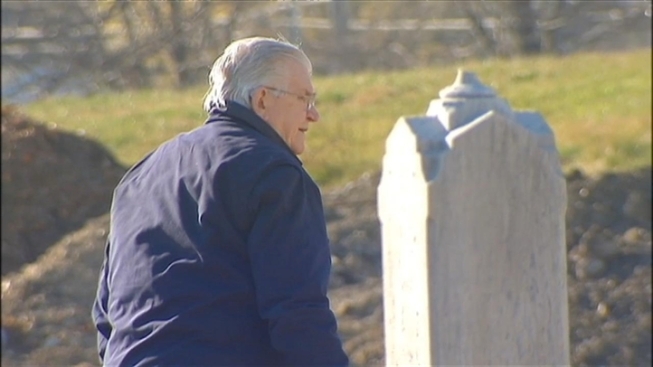 "Unfortunately, the cemetery was in the path of a runway," Andolino said. "It is a very sensitive issue, one that if given the choice you look to avoid. Unfortunately, we couldn’t." Still, Andolino said she made certain that the city hired the best people to make the move as kind to the families as possible. "We treated it as if it was our own family members," she said. Indeed, while Sell remains heartbroken over the involuntary move of dozens of his relatives, others tell stories of overwhelming acts of kindness on the city’s part. "It couldn’t have been better," says Kathy Phelan, who says she had no idea that she had family in the 160 year old cemetery. The city genealogist tracked her down, working backwards from the grave of a great uncle, who had been buried in the 1870’s. "We found relatives that we didn’t have any idea that we had," she said. "They actually helped bring two of our cousins from out of state." Phelan said she visited St. Johannes after learning of her buried relative and was unhappy with the setting. "It was right next to FedEx airplanes almost hanging over the cemetery," she said. "It wasn’t peaceful at all." Now, she says, her great-great-uncle is buried with his parents in Town of Maine cemetery in Park Ridge. "And they purchased a headstone that has his name on it, and both of its parents. So it’s very cool," she said. Others who vehemently opposed the move, said they were likewise touched by the city’s efforts to make the move as comfortable as possible. "We attended the funeral services of our ancestors," said Ellen Kaloustian, who had 12 relatives buried at St. Johannes. "Our great grandparents, and babies that we never even knew about." And while Kaloustian and her husband said they shared the view that the cemetery was hallowed ground which should not have been disturbed, they said they were happy with the way their family was treated, and with the area at Eden Memorial Park in Schiller Park, where their loved ones were reburied. "They’re all together now as a family in one spot," she said. The total cost of the move was about $17 million. Two slabs of the new runway 10 Center already lead up to the now-vacant cemetery on its east and west sides, and soon those two pieces of concrete will be joined. Asked if all will be OK, now that his family members have been moved to Eden Memorial, Sell shrugged. "It has to be," he said. "Let their souls rest in peace. You know, what can we do?"